PowerVM™ virtualization including PowerVM Live Partition Mobility and PowerVM Active Memory™ Sharing. Professionals who want to acquire a better understanding of IBM Power Systems™ products should read this Redpaper. 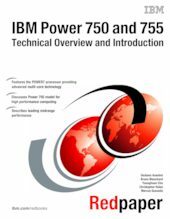 This Redpaper expands the current set of IBM Power Systems documentation by providing a desktop reference that offers a detailed technical description of the 750 and 755 systems.